While doing some research for my fave local theater, The Colonial Theatre in Phoenixville PA I came across a cool website called Another Old Movie Blog sharing the news that The Colonial Theatre in Canaan CT is for sale. If you’ve ever wanted your very own movie house, here’s your chance! Built in 1923, this old movie house is on the National Register of Historic Places. Weathering the decades and changes in film, and audience, the Colonial was closed in 1997, but later re-opened to include live theatre as well as movies. Have a look here at this website more photos, including the nifty interior, and at this website for more history on this theater. Hopefully somebody will see possibilities for the future while respecting its past. Thanks Jacqueline for bringing this to our attention – perhaps there’s someone out there who wants to own a little theatre in this cute little corner of Connecticut. Take a look at the street view of The Colonial Theatre to check out the charming downtown of Canaan with its green striped awnings and vintage sign at Mahaiwe Jewelry right next door to the theater. 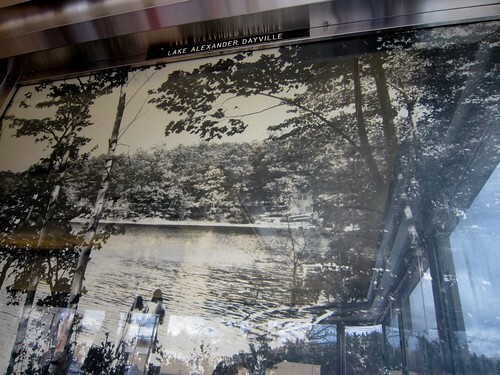 Here’s a link to a photo of the Mahaiwe Jewelry sign from the awe-inspiring roadside photographs of Debra Jane Seltzer. 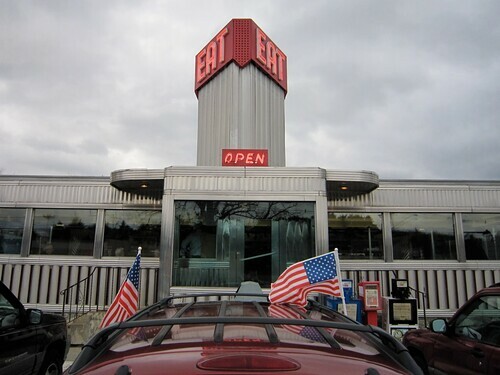 Though the chain stores try to obscure this roadside gem from sight, Zip’s Diner raises their hand and flags down passersby with one simple request – EAT! And that’s exactly what you should do should you be in this corner of Connecticut -Eat At Zip’s Diner in Dayville, CT. Even a gloomy grey day could not diminish the charm of this stainless steel diner, one of the most photogenic ones I’ve come across in my travels. I entered the diner and was pleased to find a corner booth, my favorite location in a diner. Ordered a cup of tea and was delighted with the mini teapot that it was served in. While there were many booths and counter seats filled this mid-afternoon, you know how I wait for people to leave the scene so I can snap a photo, so here’s a shot of the formica table and rounded ceiling of this 1950’s era O’Mahony diner. 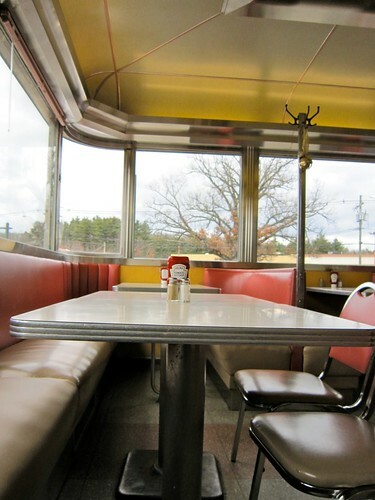 Here are some more great photos of the interior of Zip’s Diner, courtesy of our pal Gunnar at Eccentric Roadside. And here’s what I had for lunch! While the weather was cold and gloomy, I left Zip’s diner mosty toasty. 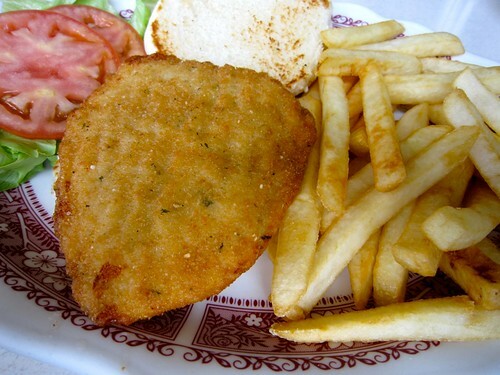 A swell lunch at a vintage diner like Zip’s will do the trick! Open 6am-9pm every day. Don’t zip by, pull off the exit and check out the neon when its all lit up, or sunny out! 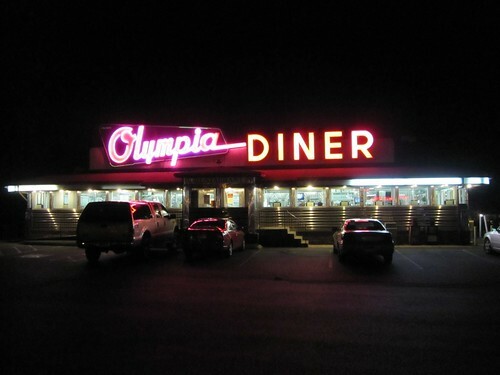 Olympia Diner Newington CT – Love That Vintage Neon Sign! The bright neon glow of the fabulous Olympia diner sign in Newington Connecticut was a welcomed sight as we made our way towards Mass via the Berlin Turnpike on our last trek home. We were totally pulled into the tractorbeam of this bright oasis and I’m superpsyched to add this roadside delight to the RetroRoadmap of CT! 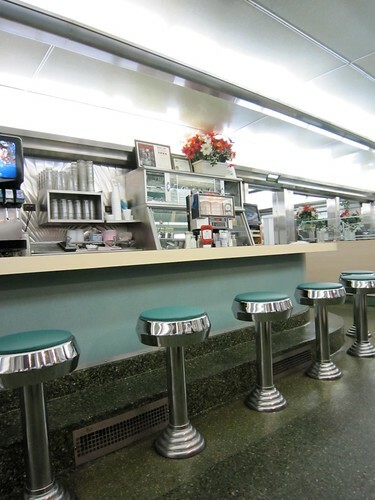 As we entered this 1950’s era O’Mahoney diner we were pleased to see that the interior did not disappoint, and we were told to sit anywhere we’d like. We opted for a booth near the entrance but they also have an extended dining room for larger parties. 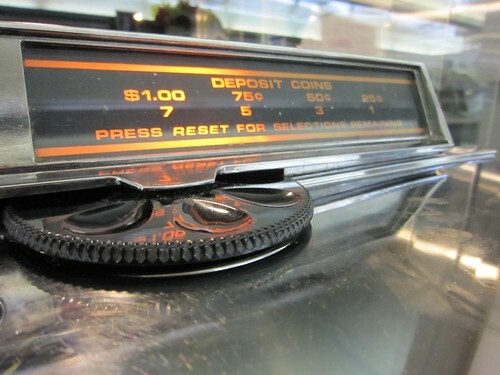 Usually the tabletop juke boxes don’t work, which makes me sad, but in this case they were operational. Much to our dismay however, the folks behind us were pumping in quarters during our entire stay and had less than great musical taste. Luckily the food we ordered (cheeseburger / BLT) tasted better! 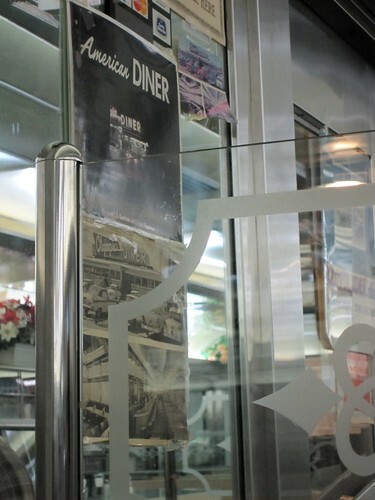 As I was looking over RetroRoadhusband’s shoulder I realized why the Olympia Diner looked so familiar to me – and realized it was featured on the original cover of American Diner by Richard J. S. Gutman himself! That’s a copy of the cover behind the cash stand. Food was good, the folks working there nice, and glad to know they’re open every day ’til Midnight. I recommend going at night so you can see that stellar neon sign all lit up! The Berlin Turnpike was lined with old motels and hotels as well, they were fun to look at too. 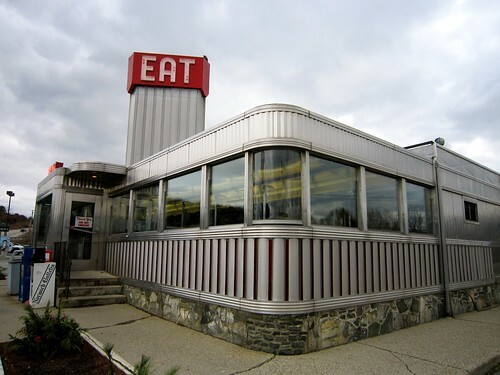 We were about to give up on eating at a Retro Roadmap -worthy restaurant in CT – all the diners we saw as we got off of 95 onto Route 1 were either closed or too Jersey (stainless and stone) for me. 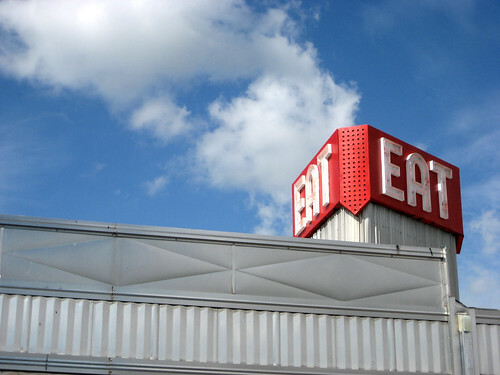 As we were pulling over to look up directions to a possible destination in NJ I saw the light from our car reflecting off of big brushed stainless sign letters and got a quick glimpse through wide venetian blinds of folks sitting at tables basking in the glow of a neon pizza sign. By staying on the back roads just a few moments more, we lucked out and discovered Salerno’s Apizza in Stratford CT.
We turned the car around (spying a duckpin bowling alley in the process) and hooray, the place looked pretty busy for that stretch of Route 1, especially on a Sunday night. As we walked in we saw folks leaving with pizzas ( Apizza is a uniquely Connecticut term) and the dining room was nicely bustling with couples, folks with grandkids, and families. We were offered a booth and sat down to peruse the newspaper style menu. Seems as if Salerno’s is a local institution, since 1947 when it was located in the East End of Bridgeport CT and was called C & C Pizzeria. 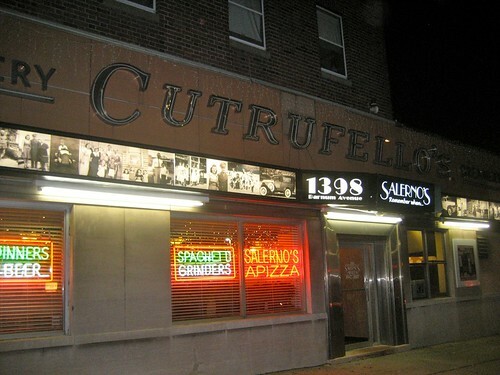 The big sign you see you see outside is not Salerno’s but rather for Cutrufello’s Creamery, also local institution of sorts, famous for their cheese and pasta. 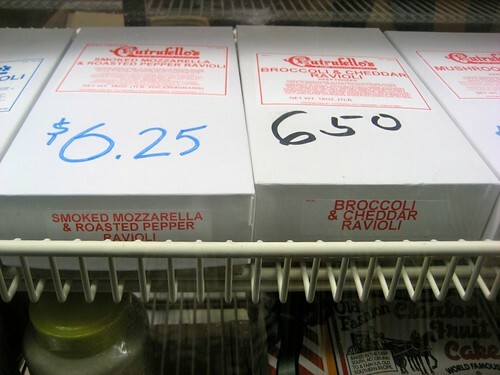 It appears as if the Cutrufello’s company store next door has closed, but Salerno’s carries some of their cheese and raviolis in their case, along with Salerno’s home made sauce. I could go on about the new decor trying to look old, and how the playing of hits from the 40’s and 50’s in the background added to the old school ambiance. But instead I will spend a bit of time on the food, which was a very nice surprise. We were presented with a basked with a warm fluffy mini loaf of bread and our waitress was incredibly attentive as far as drink levels go. 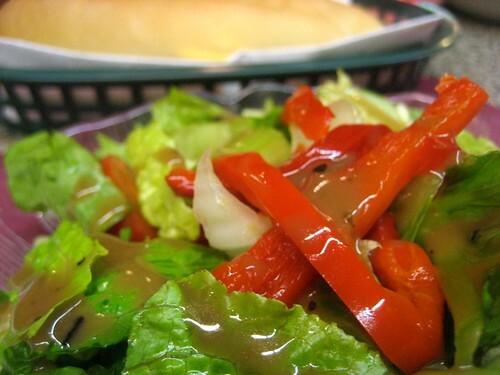 Salad was bright and crisp, with a very tangy balsamic vinaigrette dressing. 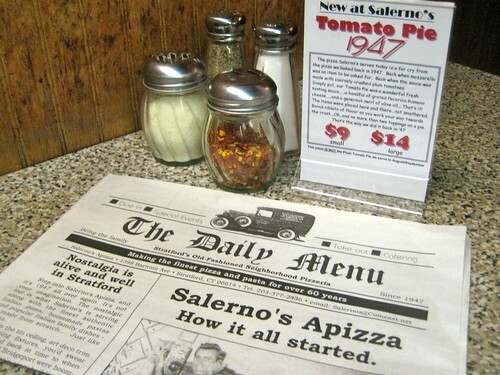 Salerno’s definitely harkens back to the olden days with it’s “new meaning to look old” even becoming the meeting place of the East-End Alumni Association, a collection of folks who grew up in the area from the 1940’s – 1960’s. The first Sunday of every month is East Enders’ Sunday at Salernos, and I just think it’s great that folks get together and relive that sense of community that I just don’t think us busy “youngsters” have. 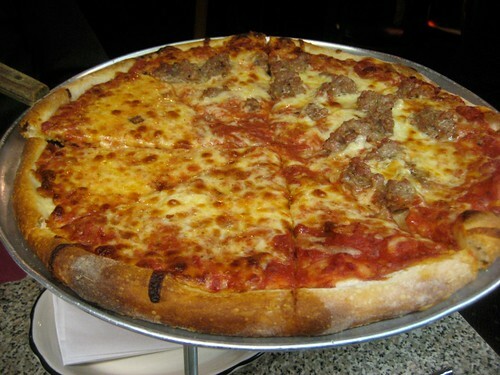 So pull yourself off the highway and get yourself an Apizza with scamozza at Salerno’s and enjoy a Connecticut step back in time.